Swimming Against The Tide – Tsubasa Frameworks. has fallen out of fashion somewhat. We all see this in our everyday lives and, for the most part, we all go along with it; swept up by the ever quickening current that comes with each new turn of the tide. But we also see that some people choose to reject this acceleration of life and try to apply the brakes in some way. They choose to either fight the current or, occasionally, get out of the water altogether. ‘We don’t ask what. We ask who. Who is this rider and how can we capture their spirit in this frame. 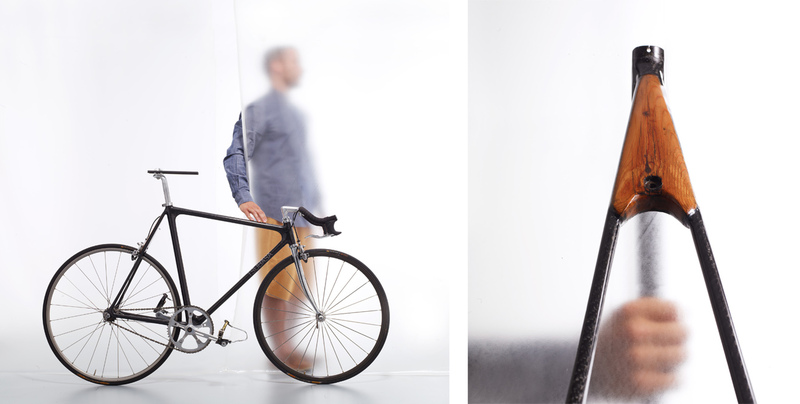 I first saw Edvinas Vavilovas’ striking carbon-fibre frames at Bespoked back in April. I didn’t get to meet Ed at that time but, looking at his idiosyncratic bikes and reading the poetic accompanying pamphlet that lay on the hay bales that were being used as his exhibition stand, I could see that here was one of those brave souls who are determinedly swimming against life’s current. ‘We believe in fresh pieces of paper. We are never presuming that the rider before will be the same as the next. All riders are different and it’s the difference we’re interested in. ‘To capture their spirit we follow our riders. We question. We question. We observe. We study. We learn from the customer, never simply telling them what they want. We let the rider speak. We give the design process time. A lot of time. It’s the only way to truly capture the spirit of the rider. everything is. How ordered and particular it is. New straw bales are here, ready for Ed’s next exhibition at London Design Festival, and the now familiar frames are hanging up on the wall on custom made brackets. There is also of course what would normally be the detritus of workshop life: tools, parts, materials, sketches and designs as well as the inevitable odds and sods of work in progress, prototypes and inspiration. They are all here, along with a number of carbon frame bikes that Ed is in the process of doing ‘modifications’ to, but everything obviously has a place to be and is most definitely in it. Tools are arranged on the workbench with what looks to be military precision, spaced out evenly and perfectly aligned. Not oppressively so but with a clear consideration. Semi-cryptic motivational messages are hand written on some of the wall tiles. 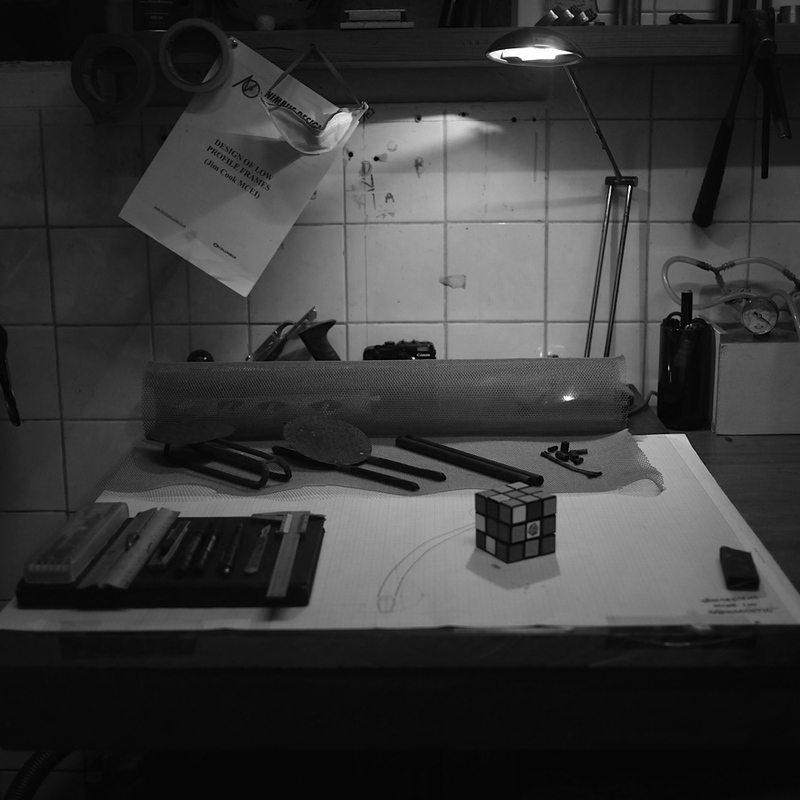 A Japanese paper fish watches over the design area whilst a Rubik’s Cube sits amongst the design sketches and technical drawings. The feeling is almost one of a place of contemplative study rather than a creative studio. I see no radio, no external interference. Just Ed, the dog and his thoughts. ‘We remove the boundary between man and bike. We believe man and bike should be best friends. Bike body and human body together. As I sit on a haybale and Ed settles himself onto his unique chair, which has curved rockers at the base with what look like knee-supports on the end, he looks a little apprehensive when I ask him how Tsubasa came to be. “Is long story.” he says in his strong Eastern European accent. That’s the sort I like I say, sipping my tea and settling back for the tale. Ed’s maternal grandfather, Vladimir Kuricsin, was born in Soviet Siberia and was a Red Army paratroop Major during the 1940’s. Sometime during the War he settled in Lithuania’s second city Kaunas, where he eventually raised his family and then watched them raise their own. During long summer holidays at his Grandfather’s house in the countryside Ed was deeply inspired by this outwardly strong, uncompromising man who also had an inner sophistication and intelligence. “A man who had no idols. '” says Ed a couple of times during our discussion, seeming to suggest that the old man would not easily accept received wisdom either; a key trait that has survived down through his offspring. 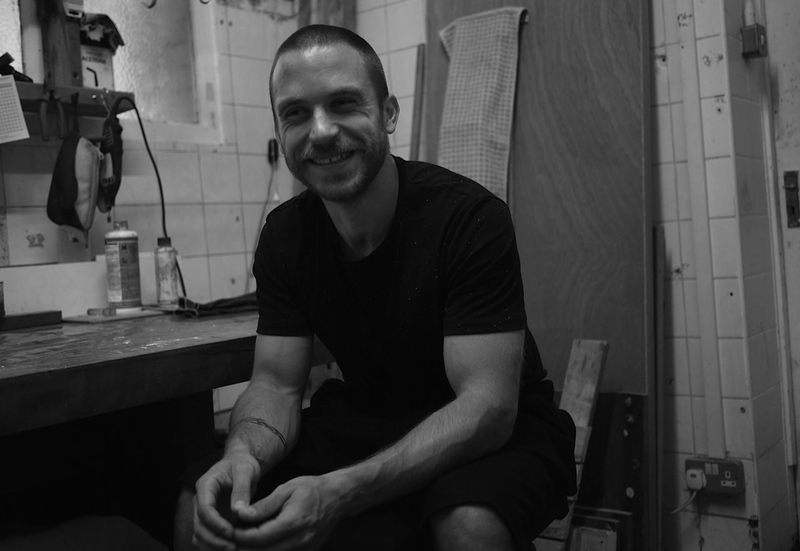 The young Ed moved to London in 2001 for a year and a half but returned home to study Street Art and then Architecture in Lithuania. After four years he enrolled at Central St Martins to do another BA degree in Architecture, “To get a different point of view, a different perspective. The course was called Spatial.. Spatial….” He tails off vaguely as if it were fifty years ago rather than five. “It was something with space..” It’s perhaps little wonder that he slowly became more interested in a more personal project. The idea of creating bike frames was not originally in Ed’s mind at all. Indeed it’s only thanks to the vagaries of European import and export laws that we are getting to see these wonderful creations at all. Ed was more interested in motorbikes when he moved to London but as Lithuania was not yet part of the EC he couldn’t bring his over with him. “I wanted to be back on two wheels,” he says “so I bought bicycle. But I didn’t really like.” That awful black Cannondale hybrid was the final straw which galvanised Ed into the decision to make his own frame. He started with a simple proposition – that it had to be 100% perfect for him. As part of that perfection meant it should be lightweight and aesthetically shapable he set about learning about carbon-fibre. “I believe there is enough information out there to do anything,” he says, with more than a hint of his grandfather’s stubborn persistence. “I thought it would be quicker to make for myself than try to find exactly what I wanted elsewhere.” So he sold his stranded motorbike, bought some equipment and made his first frame. I’ve put a few bikes together in my time and I have a yearning to find some time to go on a frame-building course but it has never occurred to me to begin building carbon-fibre bikes from scratch at home. That’s what Ed did. And even then he rejected most of the wisdom that he found and developed something new which addressed what he perceived as one of the main issues with carbon fibre. 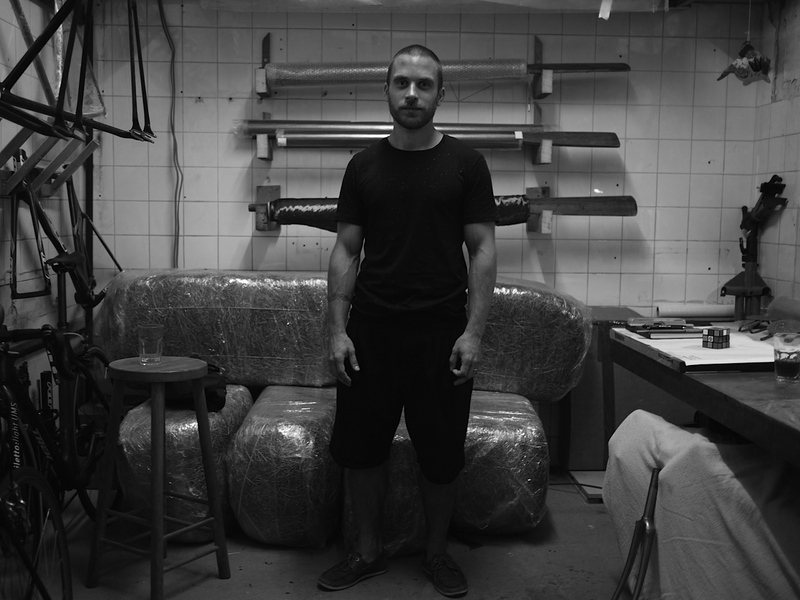 Over the course of nine months, as he and his Japanese wife Noe – who he met at Central St Martins – fixed up their new home during the day, he starting making what became a low-profile carbon monocoque in the evenings and weekends. “In the bath tub.” he recalls with a grin. He named the finished frame the Tsubasa T-01, using the Japanese word for ‘Wing’ as a nod to his relationship with his wife and her support of his new interest, and integrated a piece of the timber flooring from their old flat into the seat stay cluster as a gesture of the personal journey they were undertaking at the time. “It’s an interesting visual conversation,” he says of the difference between the carbon and the timber. T-01 wasn’t a straightforward journey. Ed says that the nine months gestation period included time for much “making, breaking and making again” as he learnt about what he could do and how to do it. His determination to dive in at the very deepest end of the carbon fibre waters and make a ‘single piece’ frame using overlapping carbon sheets to eliminate joints also slowed his progress. But the final product was worth the wait – even to Ed’s very particular eyes. The attention to detail – as seen in the timber seat stay and the beautiful hand-cut paper name and logo which lie beneath the final clear resin coat – are both simultaneously highly sophisticated and wonderfully simple. And different. Heart played a big role in Ed’s next frame. The T-02 ‘Miss Noe’ single speed setup was built for his wife with a small front triangle and lowered top tube to help her stand with both legs on the floor when stopping often in the city. Timber from her first family home was again brought into the frame and an unusual split seat sits atop the integrated seatpost. Ed describes his bikes as ‘spirit built, not custom built’. The frames seek to reflect the inner spiritual character of the rider as well as the outer, physical attributes. It’s a beautifully appealing sentiment and a world away from the stock joke of couples in matching cycling gear riding matching bikes. I don’t know Noe but just by seeing her bike frame I know I would find a engaging, interesting person who I would want to get to know better. It’s not a bad sales pitch. An artist, her presence is felt in each of the tweaked Tsubasa headbadges that are modified for each frame and in the beautifully considered marketing material that they are slowly creating to back the frame designs. The question of how Tsubasa would Spirit-Build frames for people outside the intimacy of self and marriage is beginning to loom in the conversation and Ed’s T-03 Kuricsin frame (it kind of knocks me sideways that these three are the sum total of his output to date) begins to address that. It’s made in honour of his paratrooping grandfather and seeks to capture some of his character at a number of decades’ remove. Described as an ‘uncompromising track bike for explosive sprints’, the frame has an unusual internally braced rectangular section throughout and a rough exterior finish that brings pre-war farming implements to mind. It would appear to be as at home being pulled behind horses ploughing furrows in Major Kuricsin’s native Siberia as it would racing around the Siberian pine boards of the nearby Olympic Velodrome. When picked up though, the lightness of this most agricultural-looking object is astounding. We talk about some of the technical challenges that Ed has overcome whilst feeling his way through bike manufacturing. The bottom bracket and the slender chainstays on the T-03 caused him the most issues recently and he still relies on others to produce forks for his frames. Tom Donhou made the forks for a recent Tsubasa and Ed is also forging links with other manufacturers to enable the realisation of his very specific dreams. So where next? Ed realises that only a select few people will have the time to engage with his methodology of getting to know someone in order to build a bike frame for them. Working full-time on Tsubasa now and with more equipment in a shed in Essex – “I build them here and fry them there” – he thinks he could complete two a month but it is the engagement process that will take the effort on both sides. A price tag from £3,000 for a Spirit-Built frame and forks is not too steep in the market place but the time spent could easily double that for a busy client. How much sweet black tea would be needed for this kind of ‘carbon dating’? Who are the people Ed hopes to tempt to Hackney? Before taking our leave, Ed tells me about his latest projects. He will be back at Bespoked in Bristol next year – presumably not shifting his exhibition stand and frames by shopping trolley this time – and is working on his next spirit-built bike as well as a range of less time-intensive (but still fully custom geometry) framesets. The next Spirit frame will honour Ukrainian frame-builder Redzhinald Vorontsov, whose Takhion track frame used cast joints to minimise drag and which helped Viktor Kupovets take the amateur 4Km world record in 1983. Ed’s bike is intended to both celebrate Vorontsov and examine the issues that are affecting Ukraine at the moment. The civil war has already meant that communication with Vorontsev has been interrupted and Ed is waiting until he can contact the old frame-maker again. Outside Jigsaw Lady and her assistant are still cutting up MDF, spewing noise and sawdust all over the yard. I suddenly realise that, even though they were only a few feet away during our time in Ed’s workshop, their noise quickly faded into nothingness as we were drawn into Ed’s introspective world. Ed’s low, thoughtful speech was often hard to pick up on it’s own but his little bubble seems to be hermetically sealed from the outside world. As we negotiate our exit from the courtyard back into the conforming world, Ed, followed as always by Lassie, heads back inside to continue his quiet swim against the tide. This entry was posted in Bikes, Interviews, Product Reviews, Profiles and tagged bespoke, carbon fibre, custom, donhou, hackney, Kupovets, Kuricsin, lithuania, siberia, spirit, Takhion, tea, tsubasa, vorontsov. Bookmark the permalink. Parkour Ride – Road vs Fixed vs BMX vs Mountain Bike.